^ Statute of the International Court of Justice 页面存档备份，存于互联网档案馆. Retrieved 31 August 2007. ^ 国际法院裁决科索沃独立合法. News.ifeng.com. 2015-08-18 [2016-05-12]. ^ Kosovo urges UN vote, Russian veto or not. Reuters. 2007-06-07 [2017-05-09]. ^ 日本重啟南極“科研”捕鯨 美澳等數十國聯名抗議. Big5.chinanews.com. [2016-05-12]. （原始内容存档于2016-06-03）. 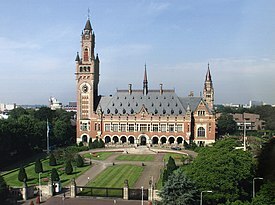 ^ Posner, E. A., and De Figueiredo, M. F. P. Is the International Court of Justice Biased? Journal of Legal Studies, vol.34 (June 2005), University of Chicago.